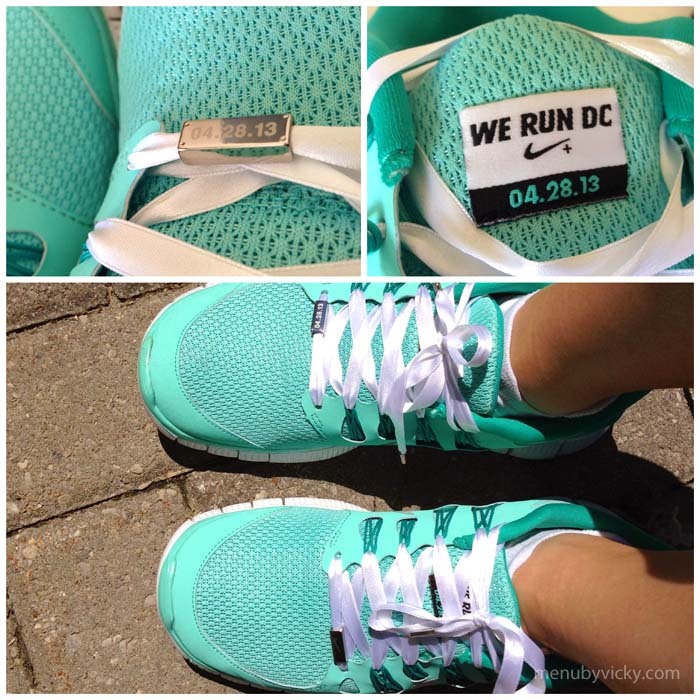 I can’t tell you how excited I was to get into the DC Nike Women’s Half! The Nike Half Marathon was a race that I had wanted to run for a while but it was out in San Francisco and I’m not a fan of hills or the cost of traveling to the west coast. 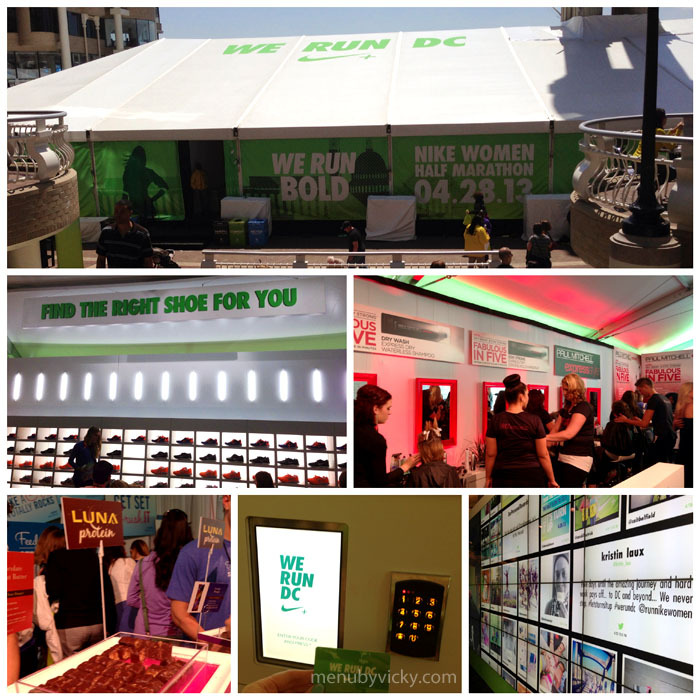 So when Nike announced that it was organizing a race in Washington, DC, I figured it was perfect for me. 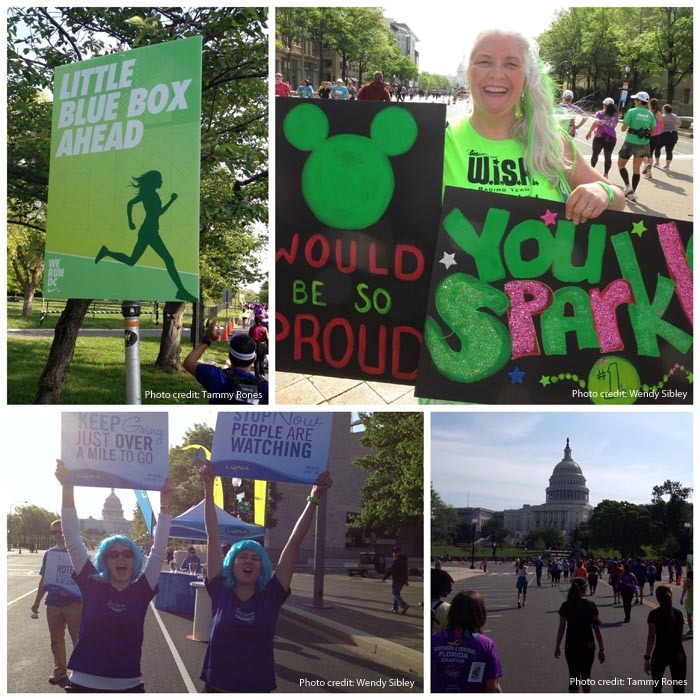 I loved the idea of being a part of an inaugural race! The weekend started 5:00AM Friday morning. I decided I would be early for a change so that I could have breakfast and relax in the airport lounge before boarding my flight. Once I landed in DC, I headed straight to the hotel, checked in and was off to Georgetown. First stop was the Nike store to see if I could get a pair of the limited edition shoes that had been specially released for the race. With all the rumors of limited quantities, I had no expectations of getting the shoes. I was surprised to see that the store still had them in stock and I was so happy to get my hands on a pair! Thanks to everyone who put up with me obsessing about these the shoes. To give you an idea of badly I wanted them – I had someone try to buy them online, someone else go to a store in New York and yet another person call stores in DC for me without any luck. I love you all! I looked at some of the other race merchandise they had available – t-shirts, hoodies, tote bags and shorts but didn’t like it enough to buy anything. I was just happy with my shoes! Shoes in hand, I headed to packet pick up expecting a long wait for the bibs. But I never encountered any lines – there were a ton of volunteers available and I was in and out within a matter of minutes. It was a breeze! Over at the expo, there were makeover sessions from Bare Minerals and Paul Mitchell, samples from Luna Bar and Nuun and clinics for gait analysis and bra fittings. It was pretty Nike product intensive but that was expected since they were the race sponsor. I did the gait analysis since there were only two other people in line. The person who did my analysis was from Toronto as well. She gave me information about my foot strike, how that affects my run and recommended some running shoes for me. We also chatted about local running routes and she invited me to attend the local Nike Run Club once I returned home. Saturday morning, Tammy and I headed over to the expo since she hadn’t been there yet. We went in but left quickly as it was packed – there were lines everywhere! We were there long enough to get the Nike+ bracelets and to check her card to see if she had won shoes (neither of us had won). 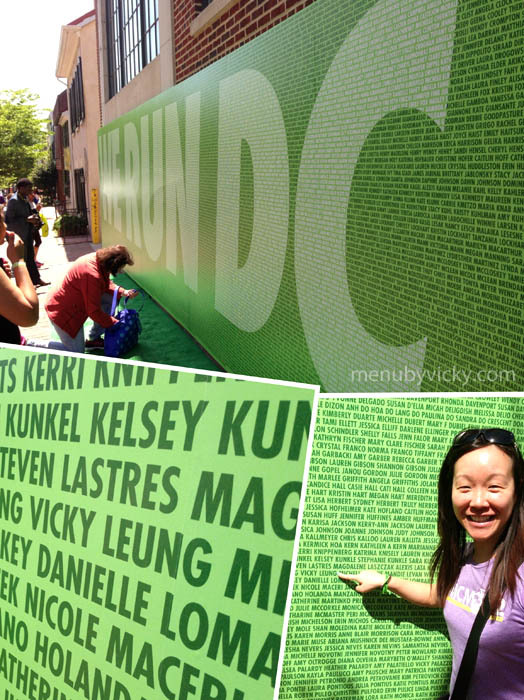 On our way to lunch, we stopped outside of the Nike store where they had giant mural with the names of everyone registered to run. Even with thousands of participants, we found our names and of course, I had to get a picture. 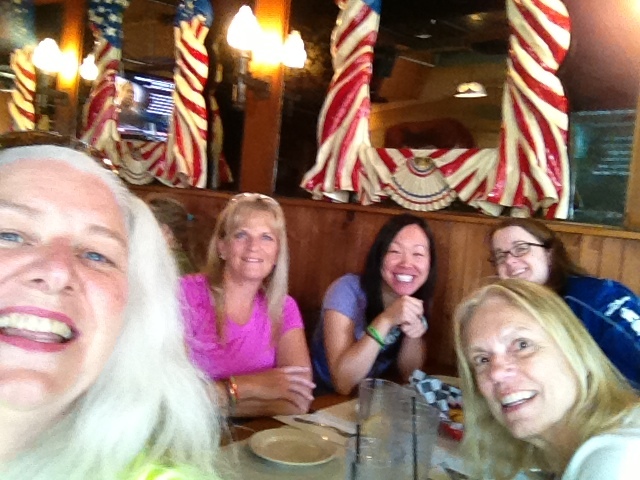 We met up with a few ladies from WISH – Lily, Katie and Wendy (psst… go check out Wendy’s blog – Wendy’s Not-So-Race-y-Reports) at a restaurant not too far from the expo called Old Glory. It was a BBQ joint and while everything on the menu looked mouth wateringly delicious, I didn’t feel like I’d run very well on a stomach full of ribs. It was so tempting but I couldn’t do it. 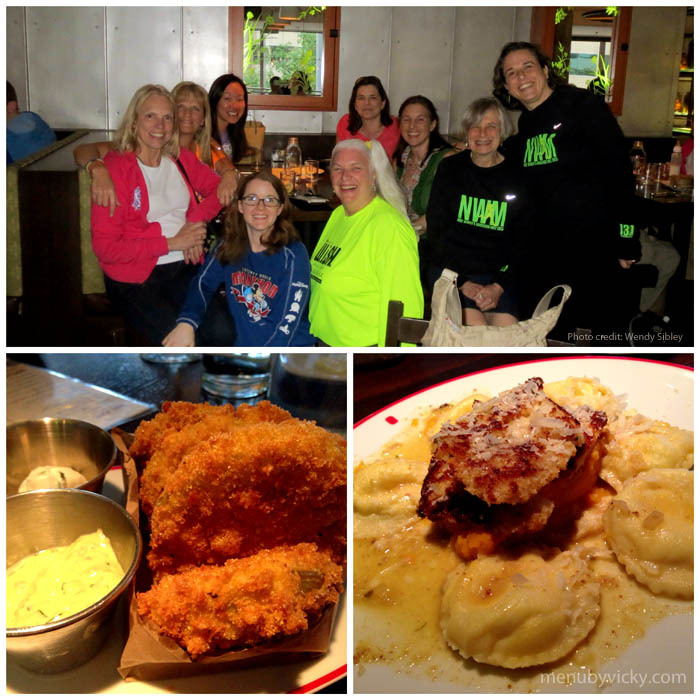 I stuck with ordering brunch instead – great food and even better company! After lunch, Tammy and I decided on some shopping. You have to love a girls’ weekend! 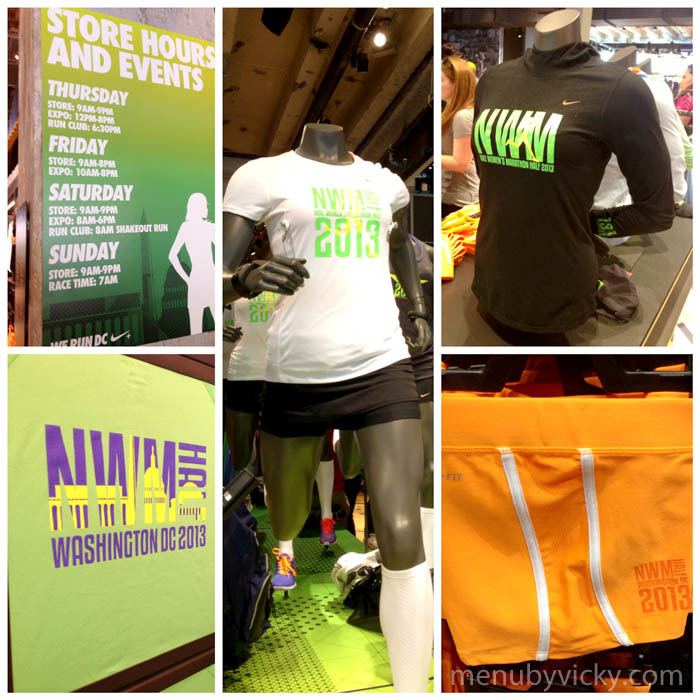 We made stops at both the Nike and Athleta stores. I thought about buying the studio wrap pack at Nike but hesitated at spending more money on shoes. I figured if I wanted them, I could buy them back home in Canada. Sadly, they’re not available here. Boo! But I did pick up a cute skirt at Athleta which is a new favorite! I was surprised by their generous return policy, compared to stores like Lululemon who don’t even allow for price adjustments or returns on sale items. I hope Athleta will eventually open stores in Canada. We went back to the hotel to drop our stuff off before heading out for dinner at Founding Farmers. I loved this place! The food was delicious and the service was wonderful! I had my first taste of fried green tomatoes and an amazing pasta dish of goat cheese ravioli which was served with chicken cutlets and a tangy ginger and squash puree. It was the perfect dish with just a touch of sweetness from the puree. I wish I had left room for dessert! I will definitely be back in October when I run the Marine Corps Marathon. After dinner, I laid out my running gear for the next day and was off to try and sleep; too bad about the noisy hotel neighbors who were up all night. Sunday morning started at 4:50AM – I wanted to make sure I had enough time to eat, get my stuff together, and not feel rushed. We made it to the start area by 6:15AM and got a quick group photo before we left for bag check and our corrals. The corrals were packed and it took me more than 10 minutes to squeeze in. I made it in just as the opening ceremonies were starting. The organizers held a moment of silence for the victims of the Boston Marathon bombing. Even though there were 15,000 participants plus spectators, the area was so quiet you could have heard a pin drop. Next, was the national anthem and we were off! View of the start line from my corral. So … squished. Well, everyone except for me – Long story short, my phone was wiped and reset on Thursday evening and though I tried to fix it as best as I could, I wasn’t able to get it back 100%. That meant I wasn’t logged into my Nike+ app, my iPod settings were gone and the phone was giving me distances in kilometers and not miles. Great. I wish I had thought of checking it before I got to the start. I had enough time to log in to the app but not to fix anything else. Maybe it wasn’t a big deal to some but I felt like it threw me off which wasn’t the best way to start a race. I wasn’t happy but I let it go. Shortly after the start, I spotted Wendy in the crowds of spectators and I waved to her. She managed to get a picture of me running by. Who needs race photographers? This was one of my favorites of the entire race! 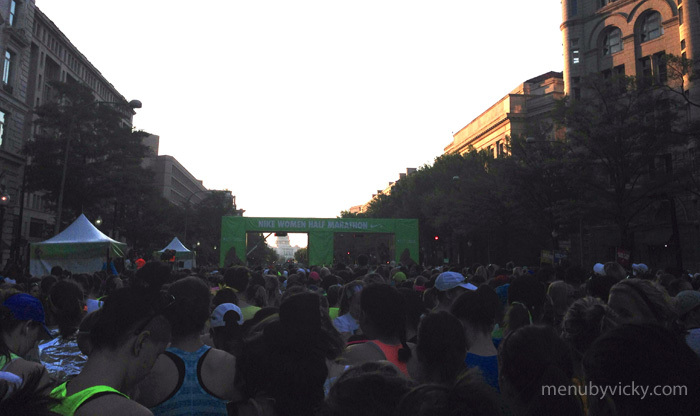 The course itself was really flat and fast – it was a mix of city streets and park land. 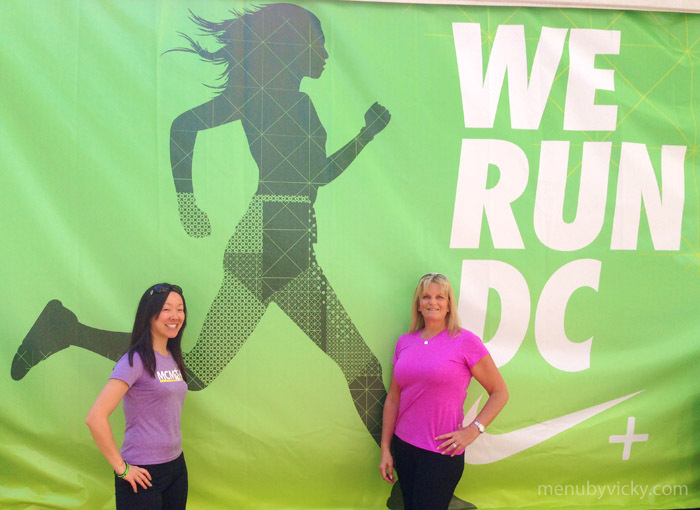 We ran around the Mall, passing landmarks like the Washington Monument, the Jefferson Memorial and the US Capital. Come to think of it, it’s not a bad way to see the city! Running through Hains Point was one of my favorite parts of the course because it’s by the water and really scenic. Nike also had several drum bands out to entertain us as well as some amusing signage. But for me, the best part of any race are the spectators! They always make me smile and give me that push to keep going! It felt like no matter where we ran, there was always a crowd gathered to cheer. As for the run itself, it turns out I didn’t need the pacing feedback from my Nike+ app. Why? While I’d love to say I ran like the wind and crushed my previous half marathon PB, I can’t. The course was SO crowded. There were walkers and ladies running side by side in groups of four or more. It was impossible to run at the pace I wanted to, but I finished in 2:08:06 which was still a PB for me. 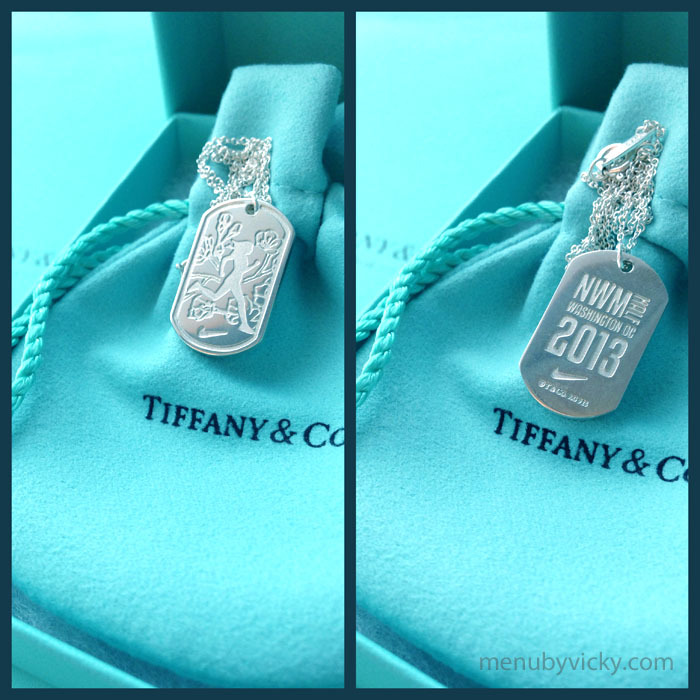 I walked through finish area and down a red carpet and to collect my Tiffany’s necklace – which is the race medal. 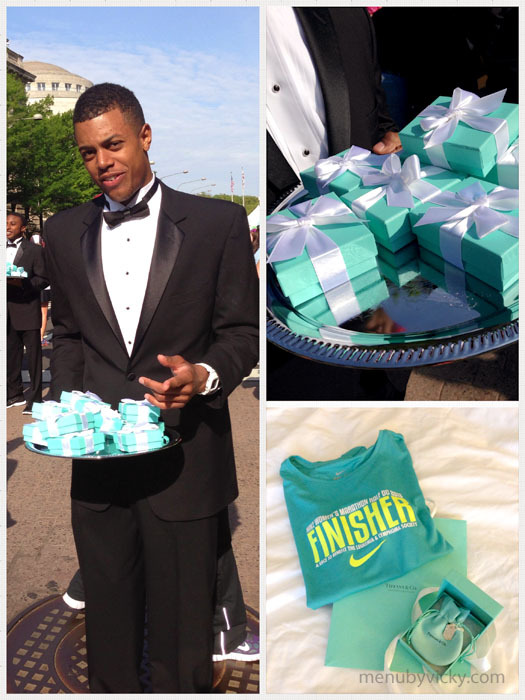 I loved the guys standing there wearing tuxedos with piles of blue Tiffany boxes on silver trays. It was the perfect touch and different than any other race I had been to! Pretty awesome race swag if you ask me! 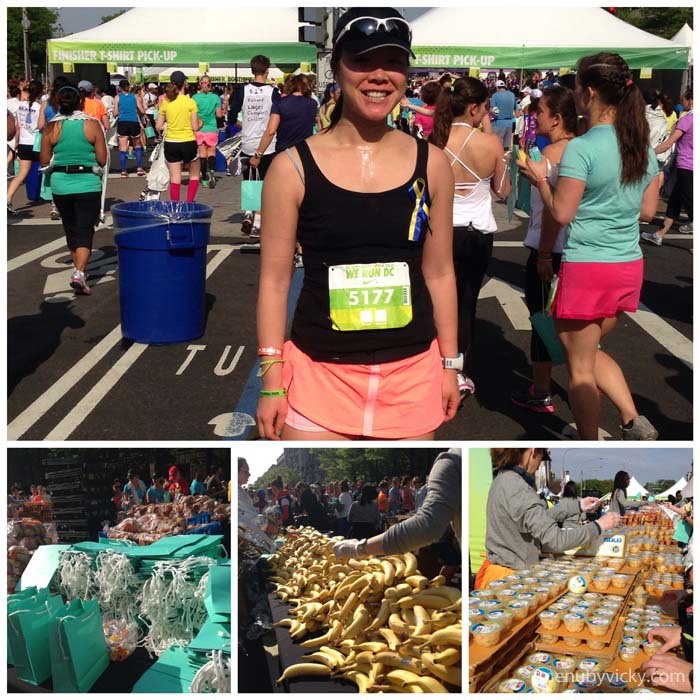 After getting my necklace, I picked up water, a bagel and then headed off to get my finisher’s shirt. I knew I had some time before the rest of my friends finished so I decided I’d go and check out the finisher’s boutique. I saw the tent and there was a line not too far from the entrance and figured “How bad could it be?” I waited and waited … and I waited some more. I had waited for about 45 minutes when the girls behind me left. My foot cramped but I was still there. Quitters. I’m kidding – I’m just stubborn like that. But seriously, standing still for more than an hour in the sun after a half marathon without shade or water was a bad idea. Other ladies in line were also complaining about the heat and the long wait. I made it into the tent only to discover that there was even longer line inside. By then, Lily and Tammy were able to join me in line. And just as they did, we watched someone ahead of us pass out. Remember how I said standing around without food or water after a half marathon was a bad idea? When I finally did make it to the front of the line, the sweatshirt I wanted was sold out. It hadn’t been sold out for a while, it JUST sold out – someone in front of me bought the last one off the mannequin. Perhaps that was my karma for letting my friends cut in line. Ah well. I bought different shirts, took one more photo and headed back to my hotel to clean up. We made it! We finished! And what race is really complete without a post-run treat. I met Elizabeth and her family in Georgetown to celebrate with what else? 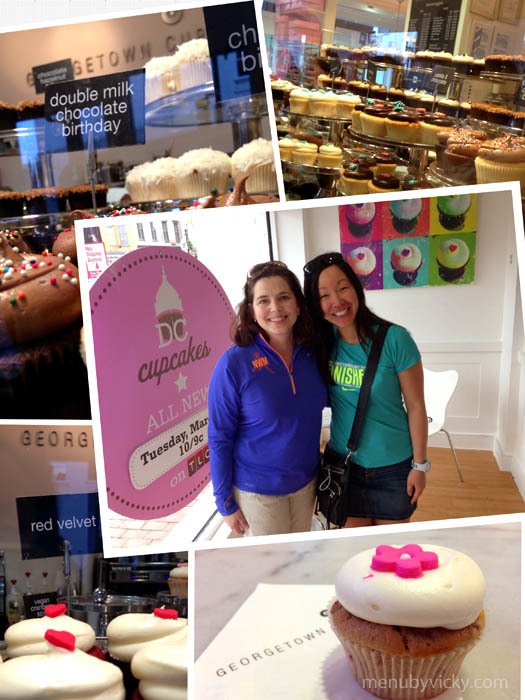 Cupcakes from Georgetown Cupcakes! Best post race treat – cupcakes! 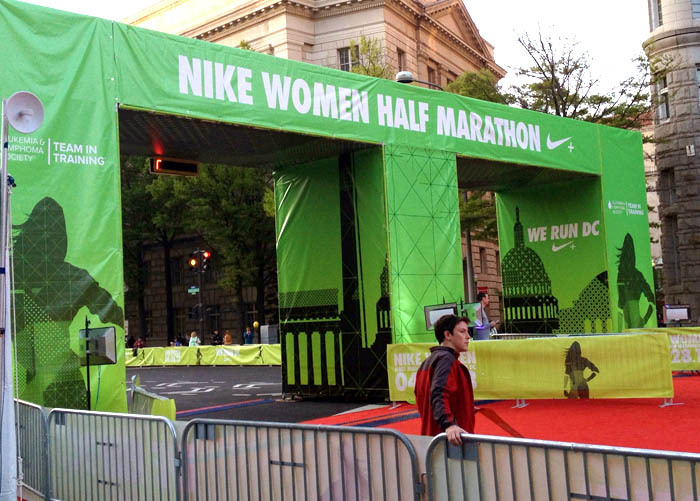 Because the Nike Women’s Half was an inaugural race, there were few issues I encountered. I thought the entire race was extremely crowded right from the start line corrals. I’ve run big races like Disney and Marine Corps and had never been so squished into a corral as I was here. I heard that people were hopping fences because they couldn’t get into their corrals. I can understand that because of how long it took me to get in. The problem was that there were runners in my corral who weren’t prepared to run that pace. I was passing a lot of people who were not running anywhere near a 9:59 m/m pace, or worse: they were walking right from the start. As for the course itself, the crowding issue was made worse by groups that were either running or walking side by side. I encountered many groups of four or more running together and it was impossible to continually weave around them for an entire race. I realize that with 15,000 participants and the popularity of the race, crowding was going to be problematic. Perhaps, for future races Nike would consider increasing the number of corrals and using wave starts to alleviate some of the congestion at the start and on course. My other issue was with the water stations. Many times, I watched runners scrambling to get from one side of the road to the other so they wouldn’t miss getting water. 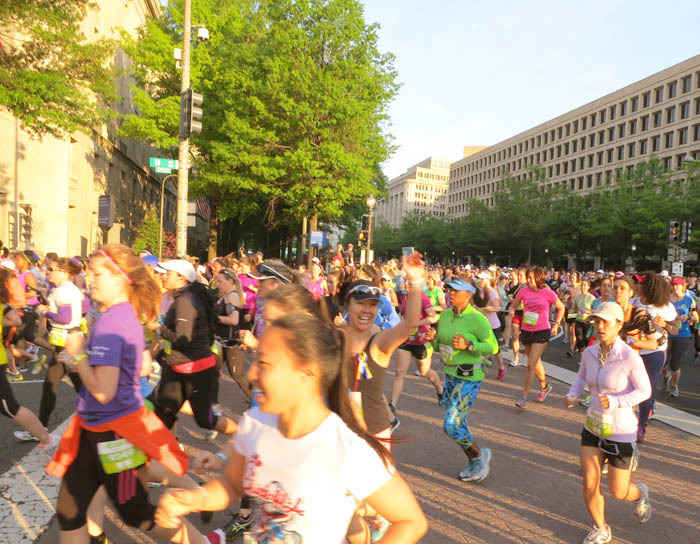 Runners shouldn’t have to play “frogger” to hydrate, especially on a warm day. Perhaps placing water tables on both sides of the roads would have helped. Finally, I wished the finisher’s merchandise had been put online, even if it was just a pre-order to be picked up, it would have helped. Standing in line for that long was not only a waste of time but also unsafe as well. It would also help to clear out the finish area quickly and allowed for the chance to stretch out after running for a couple of hours. Overall, I had a fantastic weekend with friends new and old! 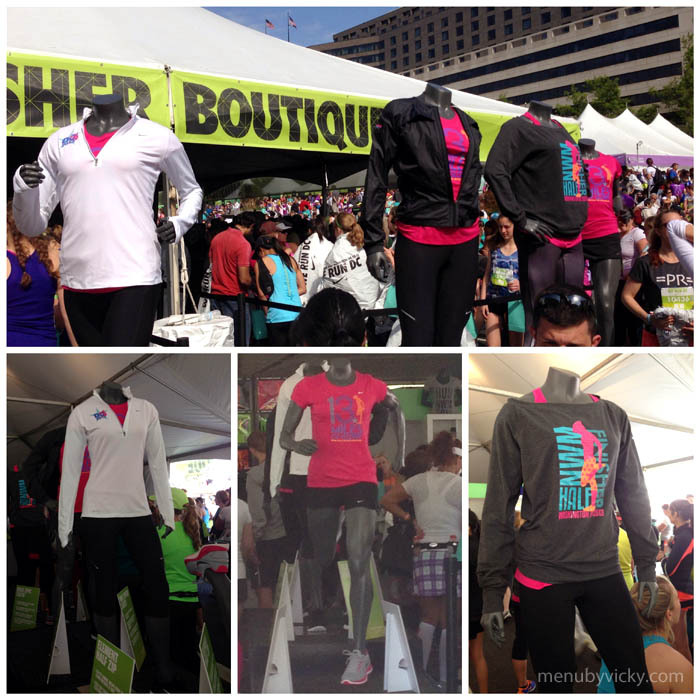 I loved the atmosphere of the city and the merchandise Nike had created especially for the race. The course was flat, scenic and filled with spectators. The volunteers and Nike employees were also wonderful – everyone who was at the expo and especially at the Georgetown Nike store were incredibly high energy and patient dealing with everyone there. Despite the crowds, this is a race I’d definitely consider for next year. Next up, the Sporting Life 10K! The crowding was a big issue during parts of their SF race too. 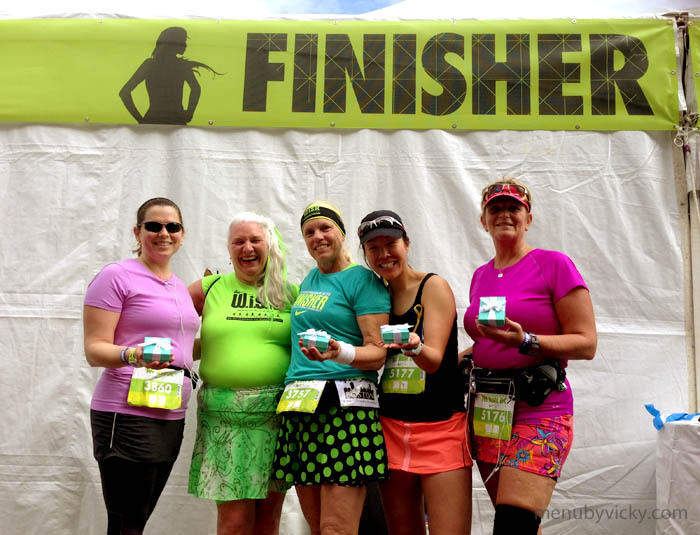 It is a neat experience that I recommend every woman runner to do at least once, but I don’t feel the need to do it every year. Oh and not sure if they have Nike Outlets in Canada, but they put all the leftover NWM gear in the outlets in the months following the race. I got 2 shirts and a hat for a steal that way. Thanks for reading Denise! I’d love to get out to SF one year – maybe next year since it’s too close to Marine Corps. 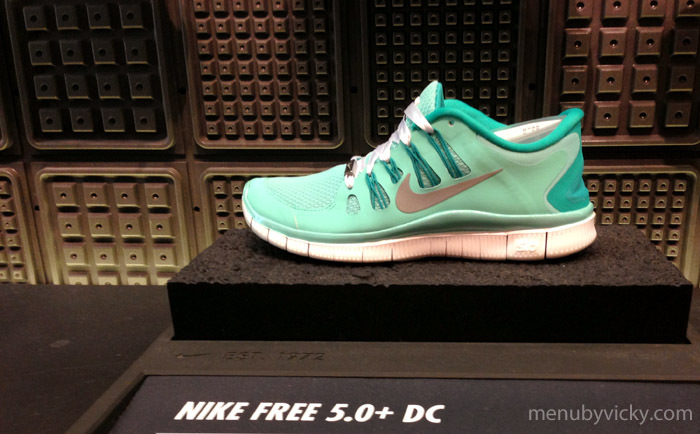 We do have Nike Outlets in Canada – they’re not as great as the ones I’ve been to in the US. 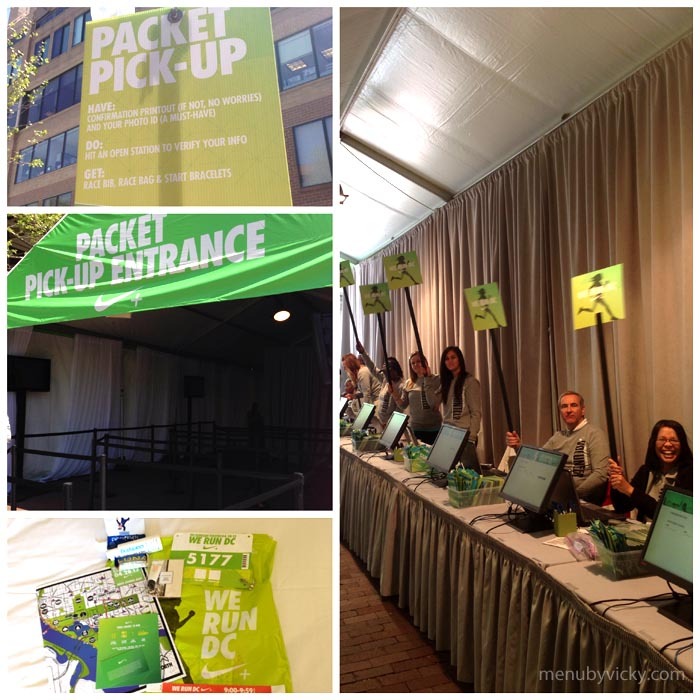 Great tip for picking up discounted race merchandise! A lot of the bigger races have special edition shoes – NYC, Disney … but I don’t think Disney has a date on their shoes. Yeah the phone reset was unfortunate. Lesson learned. Nope. I still wear mine 🙂 Do you have the link by any chance?